By Ryan Whitwam on July 1, 2013 at 12:10 a.m.
Smart emails, gel cells, and magic cards. The month is just getting started, but you can ease the transition with some new apps and games. You've come to the right place, too. 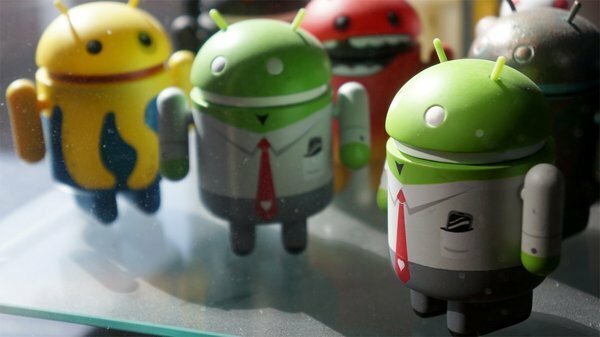 This is the Google Play App Roundup, the weekly feature where we tell you what's new and cool in Google Play. This week there's a new email app you might find useful, a game with squishy concept, and magic invades your phone. The Gmail app on Android has long been sacrosanct. Nothing could touch it from a usability standpoint, and nothing offered any compelling features on top of the Google experience. Boomerang might be the first app that does something unique which might actually make it a valuable tool to use in conjunction with Gmail. 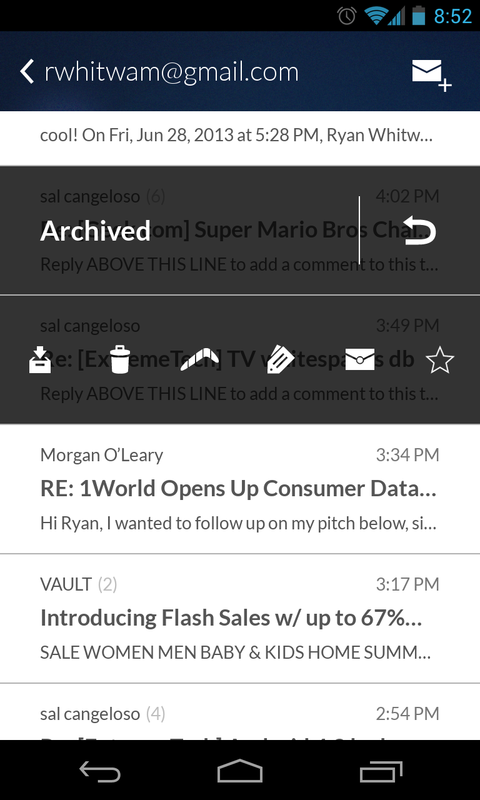 Boomerang only works with Gmail accounts for now, but it’s super-easy to set up on Android. Just choose the Gmail account you want to use, and log in. The app will pull down your messages instantly. 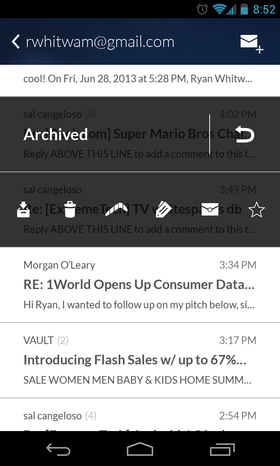 You can read email in the app, but I think for the time being it’s unique sending features are the reason to keep Boomerang around. The app gets its name from the Boomerang feature that lets you designate an email to be resent to you later. You can think of this like hitting the snooze button on an email. When the message is returned, you can have it labeled unread, starred, labeled “Boomerang,” at the top of the inbox, or any combination of those. That brings me to an important point -- Boomerang actually understands Gmail labels. The other neat thing Boomerang does is time-delayed emails. You can compose a new message or reply and set a time for it to go out. You don’t even have to be connected to the internet or have your phone on. The Boomerang service can push the email out on its own as you instruct. The UI in this app is good in general. It has swipe gestures like Gmail, and threads conversations correctly. It’s clean, but there’s no good visual feedback of touch interactions. For example, pressing on a button doesn’t change the color or contours to let you know the press was registered. There is definitely room for improvement there, but Boomerang is on its way. At this time, Boomerang is pull-only, so it won’t notify you of new emails. For this reason, it’s not a full-fledged Gmail replacement yet. The next update is supposed to add push notifications, support for other email providers, and multi-select. Boomerang is free and definitely worth watching. It could develop into an excellent Gmail replacement. This isn’t the first game of its type on a mobile device, but Gelluloid does some interesting things with swarm strategy gameplay. It’s similar to Galcon in that you take over nodes by sending your forces to them, but It’s applies some constraints to the way you move units around to dominate the map. In Gelluloid you’re in control of a series of cells and you have to shuffle green gel from one to the next to take out the enemy. Instead of being able to send gel anywhere on the map, you can only send it to another cell that is connected by a bridge.This makes some cells more strategically important than others. Some might be easier or harder to defend, or have better access to the front lines. Just tap and drag on any cell to send half its gel down the path you indicate. All the cells you control will continuously make more gel that you can ship out to where it’s most needed. In addition to the strategic location, some cells have special abilities. For example, defensive cells are harder to take over, so you have to throw a lot more gel at it to move each tick closer to control. A generator makes gel at a much higher rate. Because you’re dealing with fixed paths for your gel, you need to set up relays to keep it flowing to the “front lines.” If you long-press on a cell, then drag down one of the bridges, it will continue to send one unit of gel every time it’s produced until you tell it to stop. This way you don’t have to micromanage the whole thing. 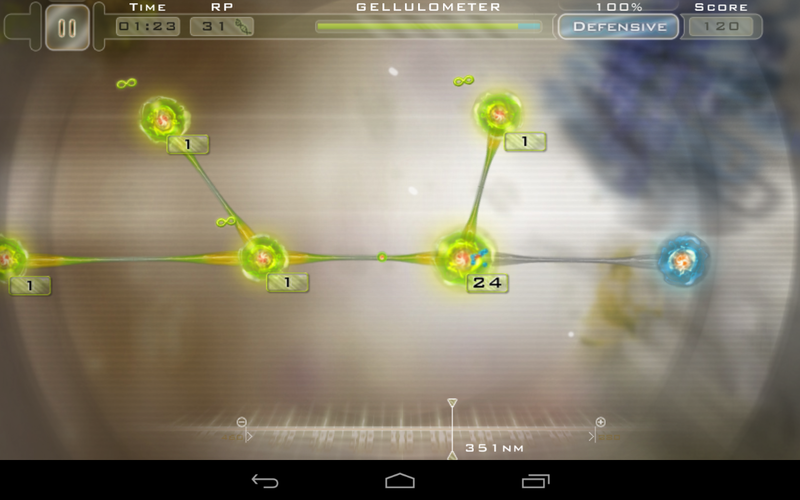 If you need to move faster, you can switch to Agressive mode to send more gel with each action. It makes you more mobile, but puts your cells at greater risk. 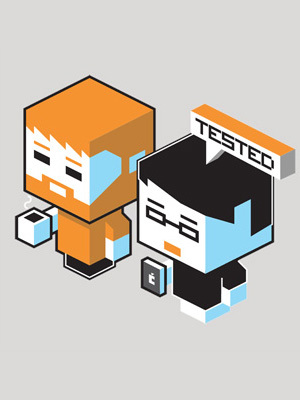 There are over 100 levels included, and they're mostly very well-designed. 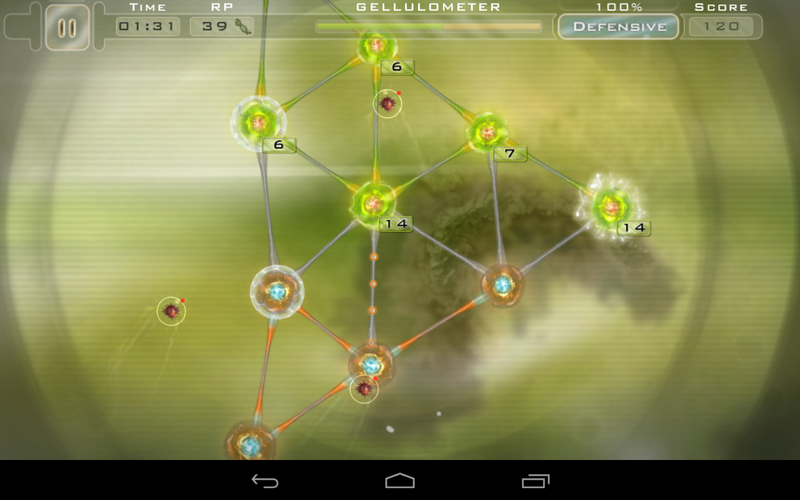 Gelluloid slowly ramps up in difficulty, introducing game mechanics as you go. It’s a compelling experience. The visuals are great for what they are. It’s a 2D top-down game, so there aren’t any crazy effects. The lighting is good, though, and makes the game feel more alive. In a game about cells, I suppose that’s important. No complaints about performance, either. Gelluloid is completely free right now, but there is an ad in the menus. You earn points in each level that can be used to buy boosts when things get tough. There is a store tab, but there isn’t anything there currently. I assume there will be eventually, but I’ve been grinding along fairly well without paying anything. Take a look at this one. I have never been a Magic: The Gathering player in real life. I’ve watched people play and occasionally marveled at how cool the cards look, but it always seemed too impenetrable to start playing. 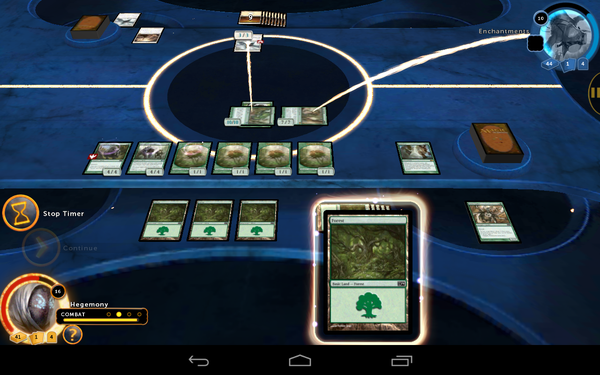 That’s why the new Magic 2014 game is so interesting. It’s actually a really good way to learn the game, and it won’t even cost you anything to get started. I won’t bore you with the rules of Magic -- there are probably many people reading this that know them better than I. 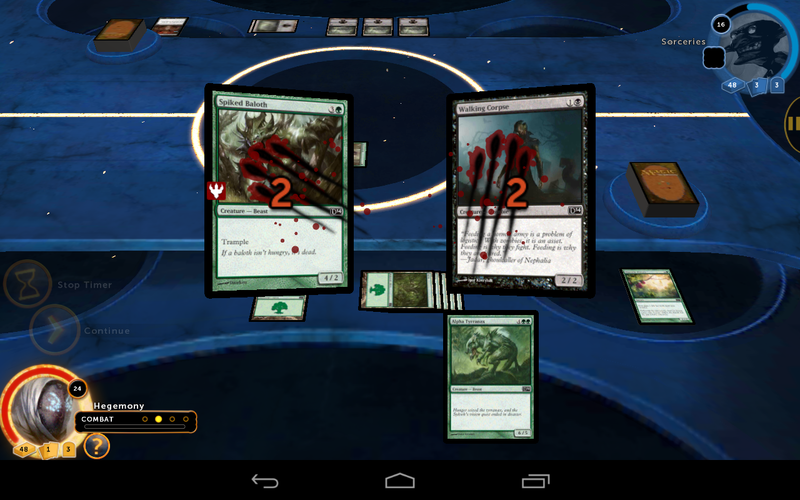 A match in the Magic 2014 game proceeds smoothly with prompts early on to tell you what you’re supposed to be doing. When it’s your turn, the game makes sure you know what you’re permitted to do. I particularly like that it highlights cards in your hand that are playable (and recommended) based on the resource cards you’ve played. This can be deactivated at higher difficulty levels. The cards in the game are the same as the real thing, and the art looks great. 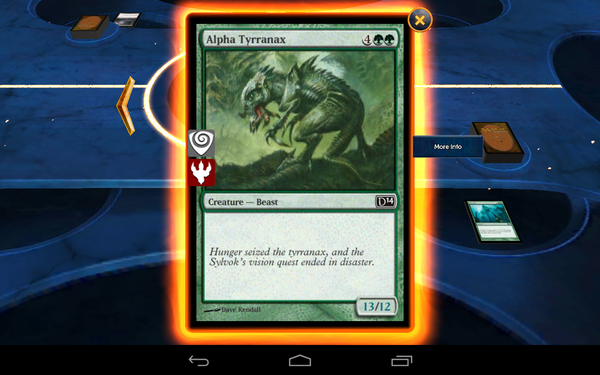 You can double-tap on any card to see it close up, then play it with the button next to the image, or simply drag cards directly from your hand onto the battlefield. After a few levels, you don’t need the guides anymore, and they seem to just go away at the right time. It’s a solid experience that teaches the mechanics well. Graphically, this is about a pretty as a card game is likely to be. The art (as mentioned above) is great. It’s worlds better than those knockoff card games that have been cropping up with increasing regularity. There are some good lighting effects, but the background of the game is a little bland. The first few battles are tutorials that introduce the various card types and explain how to attack, block, and so on. The game goes on to let you play through one campaign with three decks of cards and couple of unlockables. This is probably fine for casual play, but the full game can be unlocked for a $9.99 in-app purchase. That is a lot for a mobile game, but you get seven more decks, hundreds of unlockable cards, more campaigns, and additional game modes. The upgrade is also needed to use the local multiplayer gameplay. The only thing missing, and it pains me, is online multiplayer. This should be included, but you can only play local opponents right now. Still, it’s the best way to play Magic without buying a ton of cards yourself. $10 might seem like a lot, but the real life cards would cost you a lot more than that. That's all for this week, but check back next time for more new apps!